Prepare yourself for an unsolicited update on the status of my underwear. This could get emotional. Let’s start at the beginning. The year was 2005 and I had just moved to Jackson, Wyoming, thus accelerating my quasi-active lifestyle into the stratosphere of bro-ed out, uber-sweaty, always crushing, never bonking, super lifestyle like you read about. I was stepping my game up, and to be honest, the underwear fleet I had brought along for the ride was not cutting the mustard. Cotton kills as they say, and I was dead on arrival with my drawer of Hanes ribbed cotton boxer briefs. Back to the middle of the beginning. I’m trying to dominate the mountains, and my underwear is holding me back. This is one of those things you don’t know you don’t know. Kind of like “you don’t miss it until it’s gone,” except the opposite. Now, there are some people who can power through these types of, admittedly, first world, vanity-influenced problems and continue along with their daily lives without a care in the world for their underperforming undergarments; I am not one of those people. So there I was, soggy, bunched, and unsatisfied in Wyoming. I was desperate for a solution, but didn’t know where to turn. The usual places I bought clothes – Belk at the mall, Marshalls, Goodwill – came up empty in the performance underwear category. Patagonia had some silky boxer thingies, but I was far too deep into the boxer brief movement to go back now, no matter how nice Capaline 1 feels against my…thighs. I heard rumors that Under Armor was getting into the game, but they were smalltime back then. Then something happened that changed my life forever. I happened upon Exofficio and their brand new Give-N-Go line. This was back when they only had two colors, black and white – the white was a mistake and they don’t make those anymore for obvious reasons – and they didn’t have any logos stitched into the waistband. Made from lightweight wicking material of the finest quality, they fit like a glove and stood up to every challenge – lunges, light jogs, dancing to Shout, the works. This was the answer to all my prayers! Or was it? They cost $25 a pop. So I devised a plan – more of a scheme. I bit the bullet and bought a couple of pairs to mix in with my regular rotation, saving them for the biggest output days. I then proceeded to weird out my friends and family – mostly family – by requesting boutique underwear as gifts for Christmas and my birthday. This wasn’t a casual “I’ll make a list and this underwear will be on it,” type of deal: the underwear was the list. 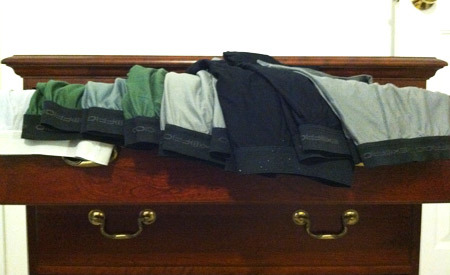 Like some crazed Beanie Baby collecting lunatic, I steadily amassed enough pairs of these wonder briefs that I was able to toss all my cotton and go exclusively Exofficio. I was high and dry and free to do whatever I wanted, whenever I wanted. I was living the dream. Yesterday, I pulled one of the first pairs from my first round of my purchases out of the top drawer, and something felt different. True, this particular pair had been on a steady decline for some time, but had always come through when I needed them. But yesterday, they looked defeated, like they just couldn’t do it, couldn’t handle the day-to-day grind anymore. The elastic got that bacon-y look, the color had faded like the skin of your grandparents. Needless to say, I took them for one last spin but it was obvious that their best days were behind them. They were done. Like any trusty piece of gear, this moment brought a flood of memories shared. That backpacking trip to Costa Rica when I only took those first two pairs (they say you can do this an the ads and they are right, I proved it against my wife’s wishes). That first day on the mountain wearing them under my long johns and feeling like Superman. All the support over all the years. I started to blame myself. The elastic just couldn’t hold up to the extra pounds, and the extra washes. Maybe if I had sun dried more, or used organic detergent, this wouldn’t have happened. Maybe if I had gone back to cotton during the shoulder season, this pair would still be with us… er… me. When you own something for so long, and is so close to you, it can be hard to let go. Nothing lasts forever, not even the best, most well made, possibly most expensive, pair of performance underwear you can buy, and I know this. It’s also not like I’ll never see them again: they are stuffed in the back of the drawer, ready to come out of retirement for spot duty when I let the laundry go a little too long. Sure, I’ve got fresh pairs in green and grey and blue now, but those will also be relegated to the bottom of the pile eventually. This was the first pair of what would become many, The Original. They are the beginning of the thread that ties my life together, from being a ski bum in Wyoming to trying to make it work in Colorado to getting married and being a father in Virginia. They were there for all of it, for all the good times and the bad. Nostalgia is a funny thing that can originate from surprising sources. My life has come a long way from when I bought that first pair of Exofficio boxer briefs, but is no less exciting or adventurous as my 8-month-old can probably attest. The memories of that time may fade, but they will always be there in the back of the drawer to come out for spot duty when things get a little too serious, a little too heavy. Such is life; such is an underwear drawer. Agree 100%. I have been using ExOfficio boxers since about 2005-2006, around the time that the REI branded performance boxers were downgraded and stopped performing while the price went up…typical REI operation…build something great at a great price…then make it cheaper for more margin. I still have my original pairs of ExOfficios and they are still performing. They have brought me to the top of 75 of Colorado’s top 100 peaks and still going with minimal signs of wear. Best on the market, no doubt. I’ve worn them on the slopes, on the trails, on the face, in the yoga studio, and in the courtroom. Can’t beat ’em, totally worth the price and these bad boys never wear out.